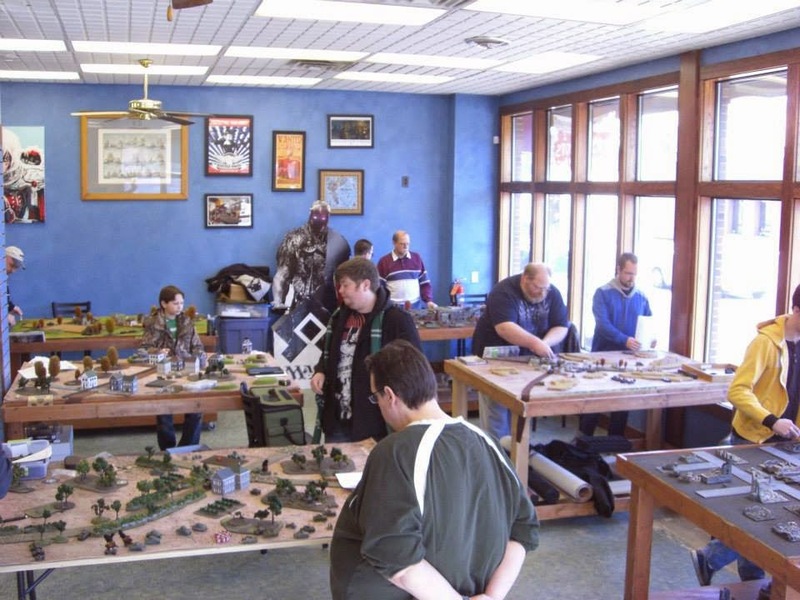 The Battle Badgers spent a little time and effort Friday night to ensure that our terrain collection and armies were properly packed and ready to go for Saturday morning. Around 7 we all piled into the two cars necessary for the toys and began the two hour drive 'up north'. 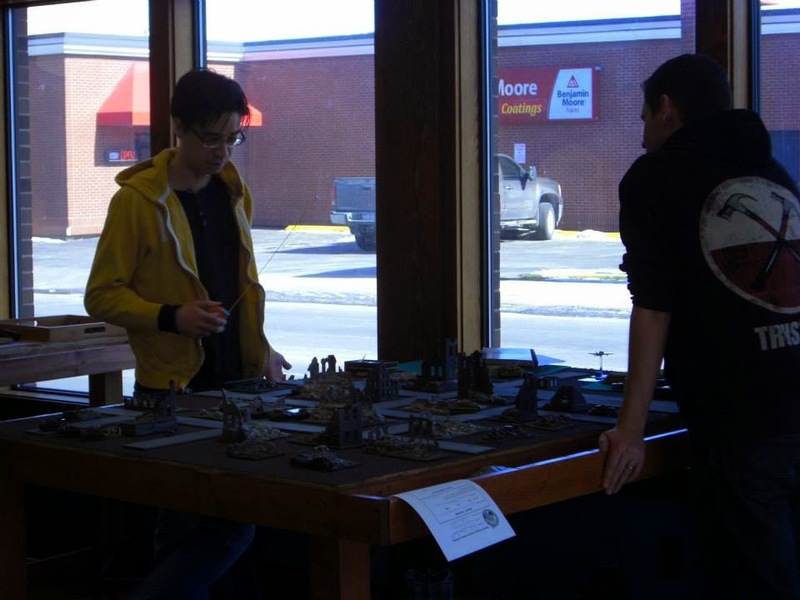 We arrived at 10 as the store opened and we went to work, with some Badgers setting up tables, some registering players, and others perusing the Flames of War stock. We ended up with 3 tables supplied by the Madison crew (thanks Joe, Mike, and Mike! ), a 4th from the store's collection, and tables 5, 6, 7, and 8 coming out of the Battle Badger Foot Locker. One of the fine tables furnished by our friends from Madison. At our scheduled 11 o'clock start we had 8 good looking tables, 16 players (I ended up playing the part of ringer when one of our players called in feeling a little under the weather. ), and a very varied field of armies, including (but not limited to) an Italian Squadrone Esplorante, a Hungarian Bicycle Infantry Company, a Czech Panzerkompanie, Brandeburger Commandos, an OSS group, and an LRDG patrol. I really wish I had more pictures of some of the models present here, Mark's Panzers, Chuck's Tankovy, and Ken's Gliders stand out in my memory as I'm writing this. Unfortunately, having to play to keep the field to an even number kept me from getting to run around and take all of the pictures I should have taken, my apologies. *EDIT* HEY! Turns out someone else picked up my slack and took a few pictures. Here ya go. 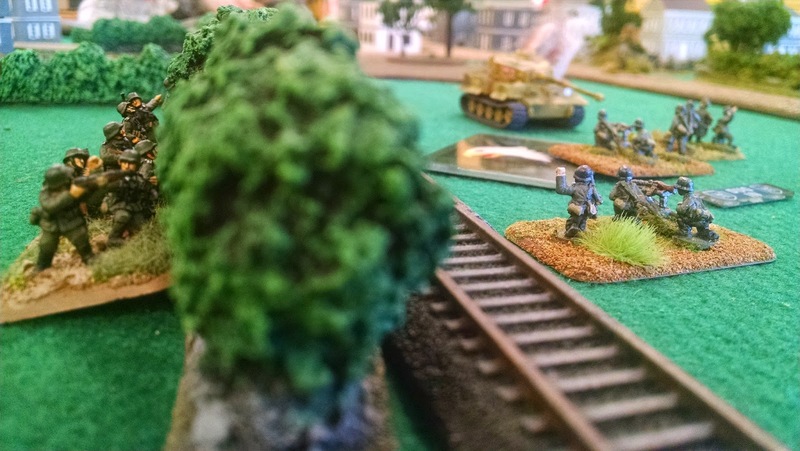 Mark's Panzers face off against Mike's Panzergrenadiers in what is obviously a hotly contested training exercise. 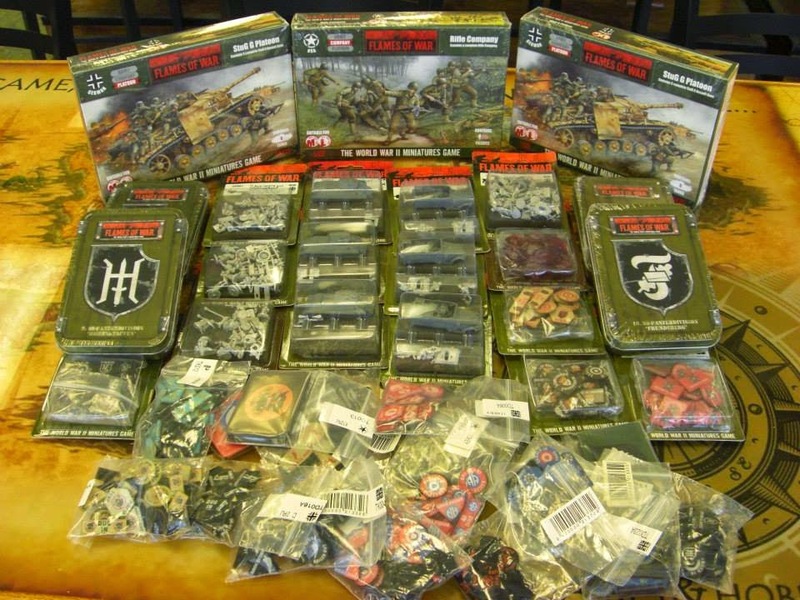 I do believe Mark's Panzers inspired me to get moving on an Early War collection. Chuck's Tankovy had a rough day, but boy oh boy did they look good doing it. 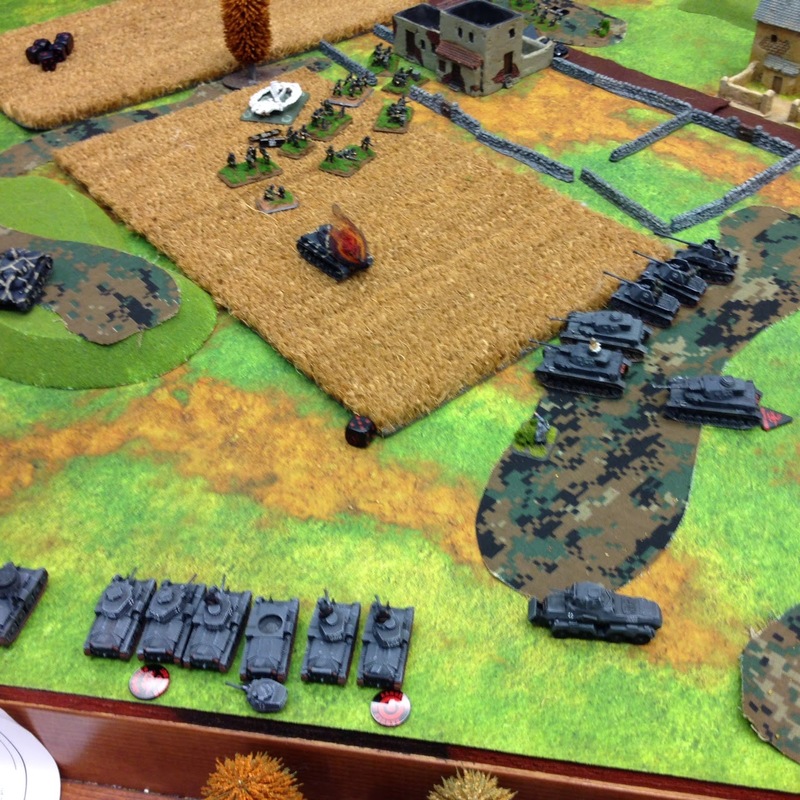 The tournament had been billed as a primer for the upcoming Mid-War Nationals at Adepticon, so we were playing Mid-War, at 1710 points. Further, the 3 missions played were randomized in the same manner as a day at Nationals: 1 random Fair Fight, 1 random Mobile Battle, and 1 random Defensive Fight. The first mission rolled was 'Dust Up'. Pairings were randomized, though we did pay a little attention to who came with who for the first round. As we had folks coming from as far away as Gurnee, IL, I figured no one wanted to play the guy they play every week after driving 3 hours to meet a new crowd. Things get under way with Dust Up for the first round. My first round game went a little quicker then I'd have liked, with my opponent's US Tank company getting the better of one of my flanks, and a single stuart making a platoon motivation check to stay on the table and begin a turn holding my rear objective. However, as far as silver linings go this was just fine, as the game was lots of fun, my opponent while new to the game was an absolute joy to play, and losing quickly gave me some time to go set up the prize support table! Usually as we get older, the toys get more expensive, but Adventure Games and Battlefront came through in a big way again. That's quite a haul eh? 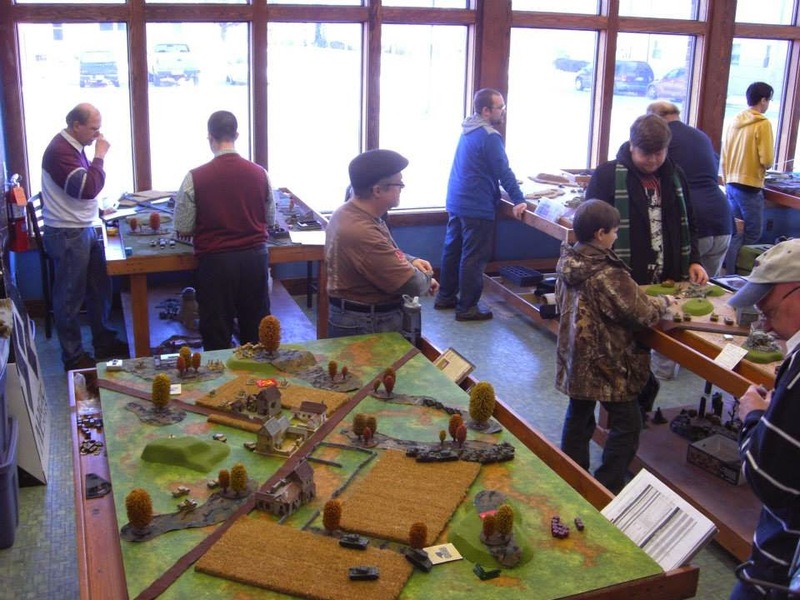 For the second time in as many months (No, really go take a look at the prize table from the Wisconsin Winter War, I'll wait). Adventure Games and Battlefront put together a pile of prizes for our tournament. Once again, everyone who took the time to come out to Adventure Games and spend a day playing toy soldiers with us went home with a prize. After round 1, a short break was planned for lunch. Teddy and Char at Adventure Games had been thoughtful enough to call ahead to Toppers and arrange an awesome deal for us. Any pizza delivered to Adventure Games on the day of our tournament was 50% off! If the games, prizes, and company didn't have everyone in a good mood yet, the cheap pizza did the trick. After the poor guy from Toppers finished delivering the mountain of pizza, and the Flames of War players had invited everyone else in the store to partake in the cheesy bounty, we moved on to round 2. Round 2 found us playing 'Hasty Attack'. My draw was Dennis, one of the Adventure Games regulars. My Schwere Panzerkompanie would be attacking his Grenadierkompanie. I went for the throat immediately as one flank had an objective with naught but an MG platoon to guard it. Turns out, that if a Tiger tank whiffs on 3 rounds of rolling, and the MG platoon is willing to continue counter-attacking time and time again, an MG platoon will do just fine for a Tiger. It would seem that despite the mission's title my attack had been a little too hasty. 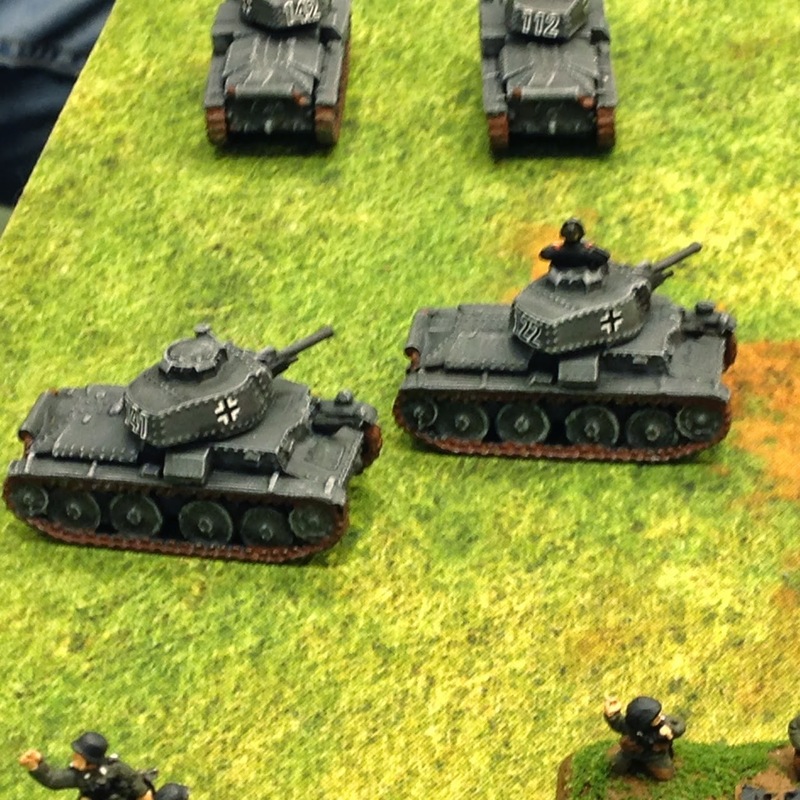 My panzergrenadiers had spent a turn pinned by artillery fire as they moved to flank. This kept them from being in position to at least take advantage of a pinned MG platoon. Though it turns out this didn't matter as my Tiger's assault failed to kill a single stand after 3 rounds of counter-attacks. While this particular assault left me scratching my head, my game with Dennis was wonderful. His grenadiers were able to hold out long enough for support to arrive. He ended up breaking my company on turn 6 or 7. Round 3 found us playing 'No Retreat', my draw was a young man who's results thus far had almost been as miserable as my own. Mike was our youngest player, but he had a surprising grasp on the rules of the game. 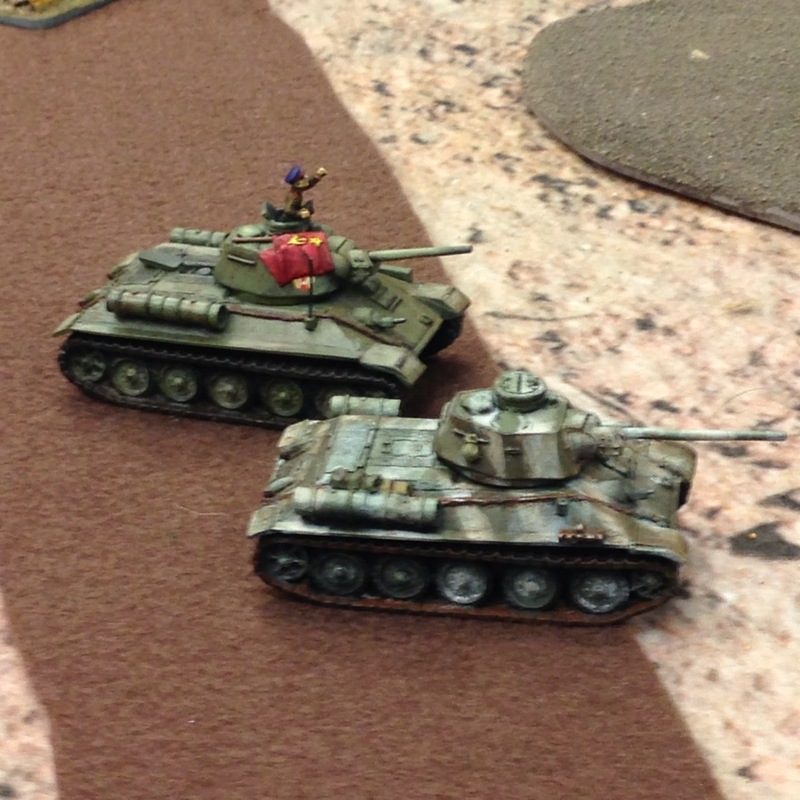 After rolling a die, it was determined that his Panzerkompanie would be attacking mine. After some incredibly hot dice, my Tigers managed to out-do his Panthers at range. The two of us then spent the rest of the round observing other games. 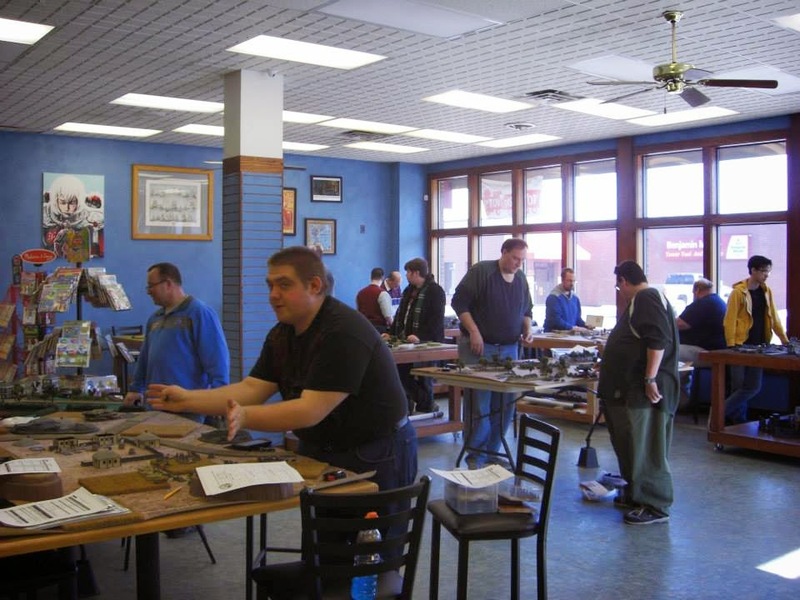 With that, we handed out some prizes, exchanged some contact information, cleaned up, did a little more shopping, and headed to our favorite Oshkosh eatery, Friar Tuck's. The burgers at this joint are fantastic. One of the guys ordered himself a double bacon cheeseburger with over a full pound of beef. 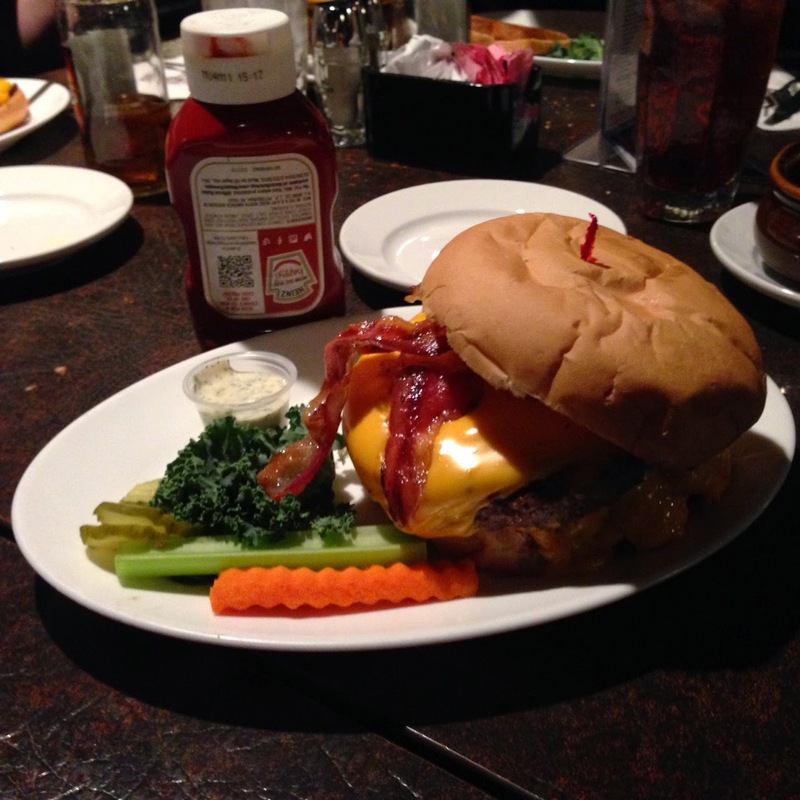 Double Bacon Cheeseburger from Friar Tuck's, with over a pound of beef. See the bottle of ketchup for purposes of scale. Shortly after this hit the table, we were placing friendly wagers on whether or not Nick could put this entire monster away. It took a little time and encouragement, but he managed the whole thing and took our money. Though, he was NOT willing to go double or nothing on the plate of fries he'd ordered with it. Want to make sure you get to take part in our next tournament? We're bringing the Cheesehead Championship to our very own Rockheads in Kenosha, Wisconsin this May. Details can be found right here. TLDR: Adventure Games is a fantastic place to play. The tournament was a blast. Friar Tuck's has really big burgers. 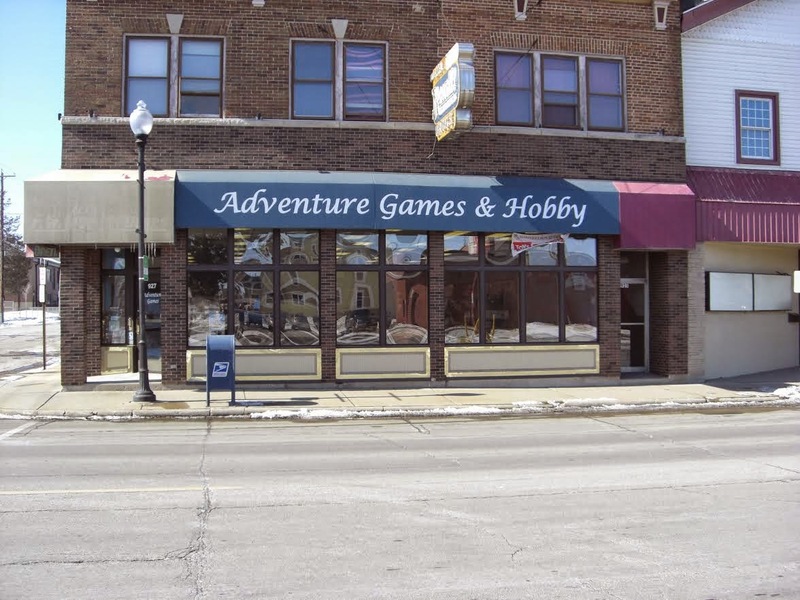 If you're looking for a place to play Flames of War in the Oshkosh area, get a hold of Teddy and Char at Adventure Games, or Dan and Mike with the Fox River Valley Rangers, or get a hold of us at questions@battlebadgers.com and we'll point you in the right direction!